James Curtis was born on 16 April 1792 in Fordingbridge, Hampshire but soon moved to Yeovil where he established a draper's shop in the Borough. James married Elizabeth Pope, daughter of James Pope and Sibyla née Pester, on 24 April 1821 at St Johns church, Yeovil. Early on he entered into the public life of Yeovil; he was a member of the Vestry and was elected Churchwarden in 1833 and 1834. In October 1835, at the Court Leet, three nominations were received for the office of Portreeve with one of the nominees to be selected by the Lord of the Borough. Despite being asked twice to attend, the incumbent Portreeve, Robert Jennings, refused to attend the Court Leet and James Curtis was sworn in as the new Portreeve. Jennings, however, refused to hand over the Borough seal, mace and other insignia claiming that the Leet's election of Curtis as Portreeve was illegal since he, Jennings, had not been present. Curtis then began legal proceedings against Jennings and in May the following year the court issued a writ demanding the return of the insignia. Following a long, protracted law suit (described in full on Jennings' page) James Curtis finally served as Portreeve from 1840 until 1844. Following in their father's footsteps, both of James' sons would become Mayor of Yeovil. In the 1841 census James and his wife Elizabeth were living above their draper's shop in the Borough with their children James Jnr, Elizabeth and John, together with two draper's assistants, a draper's apprentice and a domestic servant. James gave his occupation simply as a draper. Daniel Vickery reported “On Tuesday, June 19, 1849, the Town Hall and Market House were inaugurated with a splendid banquet, given in the large Hall of the building, when it was supposed upwards of 3,000 persons walked through the building.” Guests at the banquet, presided over by George Harbin and Dr Tomkins, included William Matthews the Portreeve, William Edwards the senior Burgess, Burgesses James Curtis and John Moore and the Clerk to the Special Commissioners, James Tally Vining. James' wife, Elizabeth, died on 16 May 1847 and in the 1851 census he was recorded as a draper in the Borough with his two sons, James and John, working as draper's assistants, his sister-in-law Sybilla Pope as his housekeeper, three young male shop assistants and a domestic servant. James had retired from the drapery business by 1861, at which time his son James Jnr had taken over the Borough shop. In the 1861 census he was recorded living at 68 Hendford. Now aged 68 he gave his occupation as 'Sub-Distributor of Stamps'. Living with him was his unmarried son John, his sister-in-law Ann Pope, his grandson Henry Snook and two servants. James Curtis died in Yeovil on 29 January 1866, aged 73, and was buried in Yeovil cemetery. James Curtis' signature against the Vestry minutes of 29 December 1831. 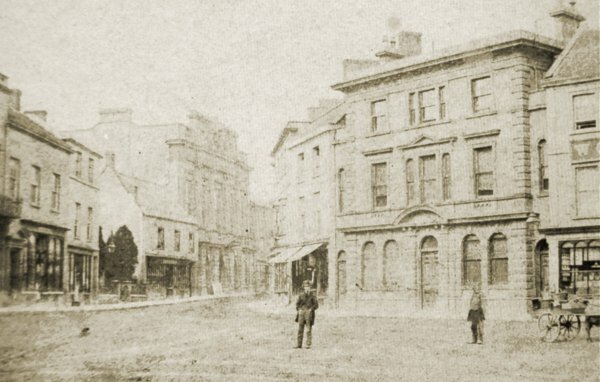 A very early photograph, dating to about 1860, looks across the Borough to High Street. At extreme left is James Curtis' drapers shop with accommodation over. Curtis lived here at the time of this photograph. 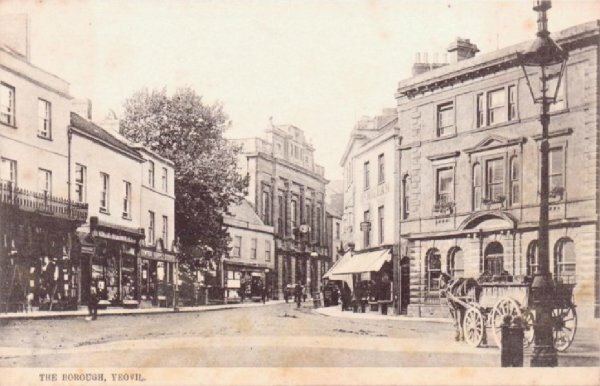 Note the Town Hall at left of centre at which James, as a Burgess of Yeovil, was a guest at the inauguration in 1849. This postcard of the Borough dates to about 1905 and shows the premises of the Damon Brothers as the first two of the three buildings at left. The middle of the three is the shop with accommodation over that was James Curtis' drapers shop during the 1850s.